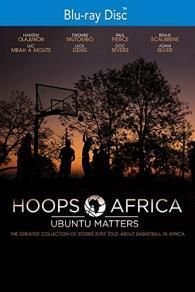 HOOPS AFRICA: UBUNTU MATTERS is a collection of stories that celebrates the past, present, and future of basketball in Africa, spotlighting the sport's impact on society and its development on the continent. From the dreams of a young Zimbabwean player to honoring the NBA legends who paved the way before him, this film journeys through the growth of the game in Africa. Centering on basketball nonprofit Hoops 4 Hope in South Africa and Zimbabwe, this documentary uncovers the role the African philosophy of Ubuntu played in the Boston Celtics' 2008 NBA Championship season and also documents the historic 2015 NBA Africa Game. Featuring Hakeem Olajuwon, Dikembe Mutombo, Adam Silver, Luol Deng, Luc Mbah a Moute, Chris Paul, Doc Rivers, Paul Pierce, and many more NBA greats, this documentary shows us all why #UbuntuMatters.